Sadhguru explains that a leader is one who can see or do something that others cannot. Sadhguru explains that a leader is one who can see or do something that others cannot. A leader is someone whose sense of identity should be beyond himself. He is willing to think, feel and act for more people than just themselves. Vinita Bali: I couldn’t agree with you more (Sadhguru Laughs). So, I want to explore two or three other dimensions that you spoke about. You spoke about capacity, you spoke about leadership. So, talk to us a little bit about what you see as, what are… Who are leaders and what is leadership? Is there a difference, is it…? Who’s a leader and what is leadership? Sadhguru: I know there’s a lot of talk about leadership and wanting to become leaders. I don’t think anybody should try to become a leader, it’s quite obscene that “I want to become a leader” – that means all of you should be what? I don’t know. I know what you would like to call yourself (Laughs). It’s not about you wanting to become a leader or someone want to be… wanting to become a leader. Because of a certain thing that you have done within yourself or a certain level of observation or a certain intelligence or a certain experience, you are able to see something that most people are not able to see. The moment you are able to see something, then people will naturally look up to you as a leader because you are seeing something that they cannot see. And if you become a leader, there are many ways to become a leader – you can get elected, you can get selected, you can work it, you can pull other people down and become a leader or simply people will rise you as a leader because they see that either you are able to see something or you are able to do something, which they themselves cannot do. I feel this is the way leadership should happen – if you want to call it that – that someone is able to see something and do something that others cannot do, so everybody wishes he must take charge of the situation because naturally, he will be able to do something that the others will not be able to do. So, what is the quality of leadership? Leadership means, once you sit on a perch, you better see clearer than others, otherwise you will make a ridiculous fool of yourself (Laughs). There’s a whole… You know, in the nation, certain things have been happening. Somebody sits on a perch and he doesn’t see any better than you, he looks like a fool immediately. So, it is not about you wanting to sit on the perch, you wanting to see something must get you to the perch, not because you want to be above everybody else you get to the perch. So, what is the quality of a leader? I don’t think there’s any particular quality. One thing is – a leader means his sense of life is beyond himself. It’s not about… His sense of identity is beyond himself. Somebody becomes a leader because he is willing to think and feel and act for more people than himself. If you act for yourself, you are called self-centered. If you just act for the sake of two or three people you gather in the form of family, you are named as Dhritarashtra. There are modern names for that. If you identify yourself with the entire nation or the world, you will be looked at in a different way. Essentially, your leadership will come from the right context, depending upon what you are identified with because everybody needs an identity. What sort of identity have you taken, will determine the context and the quality of your leadership. Vinita Bali: In that context, isn’t leadership something that, you know, each of us can individually manifest? If I were to describe one dimension of leadership as saying it is about taking ownership to create a better outcome? In that context, you know we can convert leadership from a noun to a verb? Sadhguru: I don’t know that much grammar, okay (Laughter)? Vinita Bali: But you can try. Sadhguru: See whatever we do, every human activity, the purpose of an activity is to produce something. Production may be a safety pin, a computer, love, joy, health, well-being, it doesn’t matter what, we want to produce something. When we act, we want it to be effective. How small an act or how big an act is not the important (thing?). We want something to happen effectively, which means it’s a question of efficiency, it’s a question of with how little, how much more you could do. That’s what makes you… because all of us have the same amount of time in a day. People always tell me, “Sadhguru, you had such a long day.” I said, “Unfortunately, there’s no long day, god… you know, they give me only twenty-four hours.” I would like to bargain for more but it’s not happening (Laughs). You can… You can make it more by in… increasing your efficiency, the way you function, ma… including people as a part of yourself where other people will function as a part of you so that you don’t have to bother about so many things around you. In this sense, you can enhance what you do but time-wise, all of us have the same time, we can’t help it. So, how much can you produce in how little time, in how mu… how little material, is the question. In the limited span of time, which we have as life, what is it that we can do? Is it just about efficiency? Is it about simply mindless efficiency – “Do better, do better”? No. At different times in history, people seem to want different things on the surface. But essentially, no matter which time of history, who they are, which part of the world they are, everybody wants the same thing – well-being. But their idea of well-being… Everybody has their idea how to get there, but everybody wants well-being, no question about that. It doesn’t matter which part of the world you go, whether you came here thousand years ago or today or hundred years later, you will see people will be still seeking well-being. In pursuit of well-being, maybe hundred years ago, somebody would be going in search of water. Today, you are going in search of the Wi-Fi cloud (Vinita Bali laughs) but still well-being. People’s idea of well-being, whatever that is, but people are only well only when something beautiful happens within themselves. They think they’re going to cause it to themselves by some means but people have been happy before the Wi-Fi came, people have been happy before the automobile came, people have been happy before all the luxuries we are enjoying today, appeared. Vinita Bali: (Laughs) We can guess who they were (Sadhguru laughs). 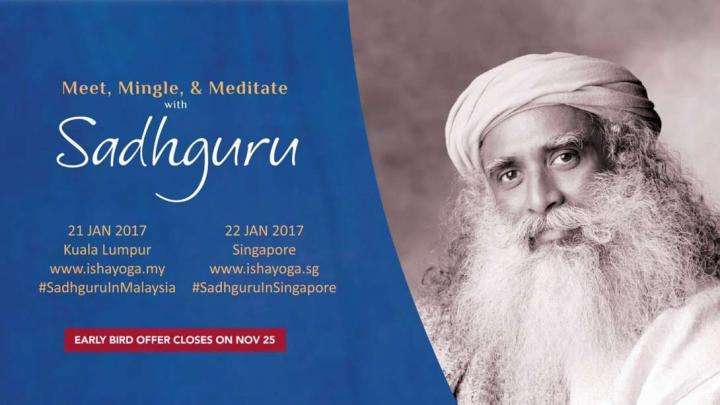 Sadhguru: So he was very resentful, “What are you doing here?” Then I told him, “See, what’s your business?” He said, “I do computers.” I said, “See, whether you manufacture a computer or a safety pin or in between anything, fundamentally, this is about human well-being. The basic business is human well-being. You may do it through your computer, somebody will produce safety pin, somebody will produce a cloth, somebody will produce something else. It doesn’t matter what you’re doing, the ba… the fundamental business is human well-being and that’s my business too, that’s why I’m here” (Laughter). Why Do Gurus Have Beards? 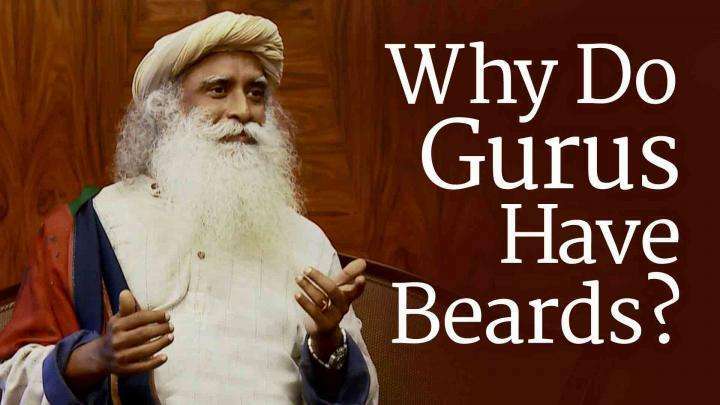 Sadhguru answers a question on why Gurus have beards. He turns the question around and asks why people are shaving in the first place. 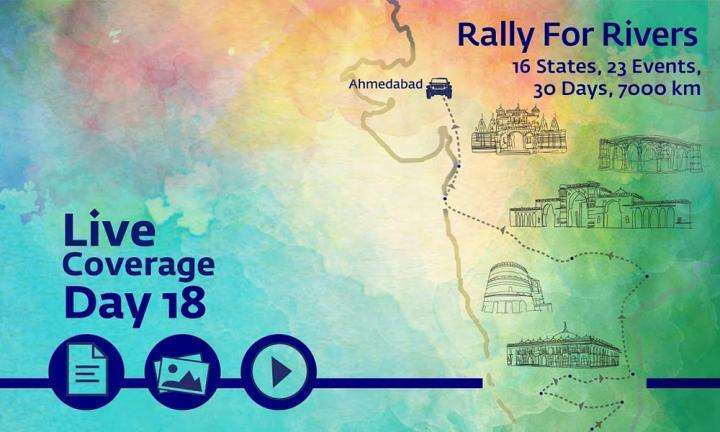 Sadhguru heads to the banks of the Sabarmati river in Ahmedabad for Rally for Rivers.